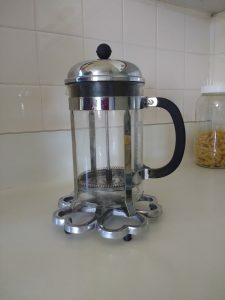 I wanted this entry to be COFFEE but it doesn’t fit the dictionary definition of an artefact, so the entry had to be a coffeemaker. And after all, without a coffeemaker of some sort or t’other, there can be no coffee. 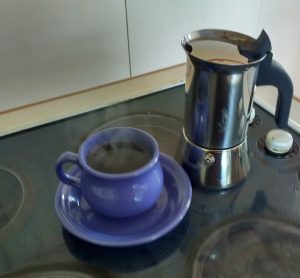 And since coffee is an essential part of the writing day, then a coffeemaker is an equally essential part of my writing life. Adhering to the Platonic principle of moderation in all things (although I believe Plato ascribed the principle to Socrates) I try to keep consumption to 1 to 2 cups per day — but I find the ritual of the coffeemaker (as opposed to instant coffee), as well as the deliciousness of the end result, helps focus the various sections of the writing day. And I believe both the coffeemakers fit the definition of functional and decorative.